About a month ago, I began to see advertisements for the film Chappaquiddick. Being familiar with the subject–Ted Kennedy’s involvement in the death of a young woman named Mary Jo Kopechne–there was no question in my mind about whether I would go to the film or not. My parents were Catholic sweethearts still in their twenties when Bobby Kennedy was assassinated in June, 1968. One of my early memories is of my mother watching his funeral on our small black and white television. Just a little over a year later, two weeks after I turned seven, Mary Jo Kopechne died, suffocated in a car submerged in the dark water just off the Dike bridge near Chappaquiddick, Massachusetts. Senator Ted Kennedy, who was positioned to run for president in 1972, was driving the car when it went into the water. He didn’t report the accident until ten hours later. He pleaded guilty to leaving the scene of an accident and was given a two-month, suspended jail sentence. I’m not sure when I truly became aware of this terrifying story. While the adults around me spoke pretty freely at the time, I’m certain no one mentioned the details of the accident right after it happened. Given my visceral reaction every time I think about it, I must have first heard about it when I was a young teenager. What imaginative child doesn’t spend at least some time thinking about drowning? Worse, I had a fear of both water and bridges. We often traveled across the Ohio River, and my sisters and I tried to hold our breath as long as the car was on the bridge. It was a great distraction. This blog really isn’t about the Chappaquiddick film. No, I won’t be going to see it. I know the story, and have read all sorts of accounts and theories about it. I won’t offer my opinion on it here. But it would be interesting to know what viewers unfamiliar with the event think after seeing the film. This blog is about a book. 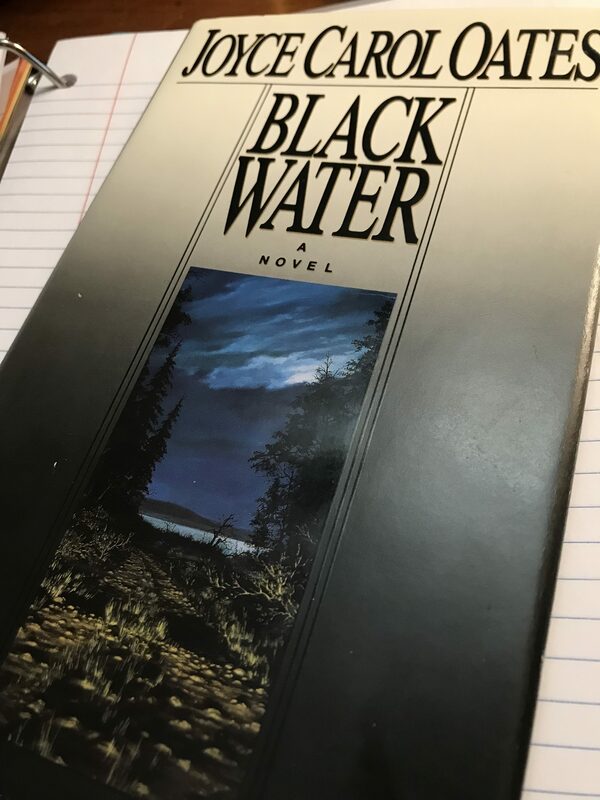 In 1993, I read Joyce Carol Oates’ novella, Black Water. Oates has boldly fictionalized real-life situations and characters in several novels: Blonde, about Marilyn Monroe; Sacrifice, about the Tawana Brawley case; and My Sister, My Love, about JonBenet Ramsey’s death. There are many, many true crime books, and novelized historical fiction is very hot right now. Oates’ writing is always intensel, and delves deeply into the psychology of her characters. So I guess it’s no surprise that I found myself profoundly affected by Black Water. It nails two of my darkest fears, and throws in the always-timely subject of young people (often young women) betrayed by powerful figures (often older men). This 1992 Washington Post article reports that Oates says, “The Senator in “Black Water” shouldn’t be mistaken for Ted Kennedy, Kelly Kelleher isn’t a pseudonym for Mary Jo Kopechne, and this brief tale isn’t about Chappaquiddick at all.” (Reporter’s quote, not Oates’ actual words.) But it is a story about a party, a senator, a girl, a car accident, a death in the water, and a betrayal. It’s all there. Black Water is written in Oates’ unique close third voice–a voice which also hints at the existence of a rather arch and wise narrator. Kelly Kelleher is her own memoirist, judge, jury, cheerleader, critic, and inner child. As she waits for the senator to come back to save her, she fights desperately to live. She’s flooded (no pun intended) with memories, and tells herself stories about what’s happening in the outside world. She clings to her optimism. I’m told by someone who spoke casually with Oates about the novella that she means for it to be read in one sitting of two hours–the same amount of time the authorities believe Kopechne lived after the car went into the water. That notion leaves me breathless. This will sound ridiculously theatrical, but I almost wish that this fact were written on the page facing the ending of the novella. The true horror of this story lies in those two hours. Forget the party. Forget Kelly’s romantic thoughts. Forget the way the senator kicks at her as he propels himself away from the sunken car. Forget the alcohol and rumors of infidelity. All you need to know about is those two endless, infinite hours. At the end of those two hours, she is dead, but the reader has visited her entire life just as Kelly relived it–In bright and dark patches of emotion, wonder, and terror. Why would I want to see the film? After reading extensively about the Chappaquiddick incident, I’ve come to my own conclusions. I’m not particularly interested in hearing more theories. The story has always been about those two hours for me. This is the power of the book. Don’t get me wrong. I watch at least a couple films a week. But film viewing is mostly passive, even when the film is well done. I’m not saying that films don’t inspire or teach, horrify or amaze. It’s only that prose fiction engages imagination and emotion in a unique way. I want more of that. Always. Okay, TKZers. How do you feel about the novelization of history? Are there any books you believe truly capture the spirit and heart of a real-life story?